Add CB2 to your favorites! CB2 is a sister store of home furnishings store Crate & Barrel. The difference between it and the main chain is that it seels products that are aimed at young adults. Crate & Barrel also owns a chain of similar stores for children called The Land of Nod. 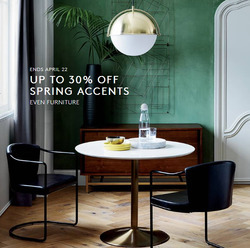 Read on to find out more about shopping at CB2! Do you want to receive more deals from CB2 by email?